WASHINGTON — All in the name of equality, it seems that ESPN and the mainstream liberal media continues to use comparisons to the civil rights movement and desegregation to push the gay agenda. This time, they’re using Jackie Robinson as a symbol for the movement. Jason Collins, the first openly gay male professional athlete, has little to show for his on-court exploits. Collins this past NBA season averaged 1.1 points per game, 1.6 rebounds per game and 0.3 blocks per game in playing for a mediocre but improving Washington Wizards team. Overall, his career numbers are unimpressive with 3.6 points per game, 3.8 rebounds per game and 0.5 blocks per game. Yet, ESPN and others call Collins a type of “Jackie Robinson” hero and that Collins’ coming out was heroic. Some made the comparison that he broke an important barrier in sports, just as Jackie Robinson broke the color barrier in professional baseball. 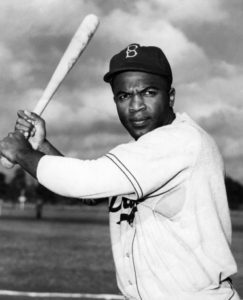 Jackie Robinson has the numbers to prove such Hall of Fame praise, being the first black player to win the 1949 MVP and won the league’s batting title, he was the 1947 Rookie of the Year winner, a six-time All-Star, his number 42 was retired across all baseball teams, and whose numbers  were mind-numbing for those days: a .311 overall batting average over 10 seasons, 197 stolen bases and 1,518 hits. And, he won the 1955 World Series. Did Jackie Robinson receive the same treatment as Jason Collins, being the first black athlete in baseball? Highly unlikely. An ESPN Magazine article highlighted how you cannot compare  Jason Collins to Jackie Robinson, yet ESPN ran with the praising of Collins as if he was comparable to Robinson. It got buried and was not on the front page of the ESPN website. But, Jackie Robinson’s numbers also proved his worth. Undoubtedly Jackie Robinson would not be in the Hall of Fame today or would not have changed the face of baseball if he did not put up phenomenal numbers as a Brooklyn Dodger. Collins, from a statistical standpoint, does not hold a candle to Robinson’s statistics throughout his journeyman career. Although comparing basketball seems like an apples-to-oranges argument, it still shows how flawed the liberal argument is. Gays in sports are a sensitive issue, but Americans are open to accepting and tolerating gays in society. However, when Jackie Robinson is used as a comparison, is not this an affront to what he had to endure? Did Jason Collins have to endure name-calling, racist taunts and constant public pressure to over-perform and perform better than his straight peers? One would highly doubt it.